Posted by Natasha in Life, Wedding. Since I last updated here, we’ve entered the 12 month count down zone. Organised the celebrant, and filled out the notice of intention to marry. Chose and booked the photographer, paid the deposit. Bought Mum’s dress – a pretty, Eve Hunter hand beaded gunmetal grey/green dress with matching bolero. Chose and booked our flowers, which are absolutely gorgeous. Came in over budget on these, but they are absolutely stunning. 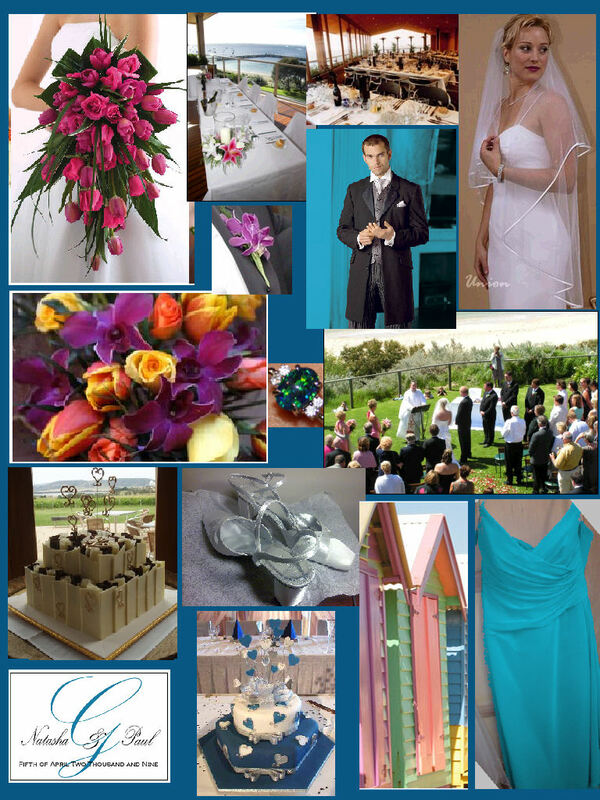 We have chosen the bouquet in the upper left of the mood board, made up of the flowers directly underneath it. The bridesmaids will have a round loose posy of the same flowers. I’ve decided to sell or return the dress I bought, I’m now going to hire one from Maggies. The plan is still to lose quite a bit of weight, and then choose a gorgeous dress. We also went looking at BM dresses in maggies, and chose the bridesmaid dresses, which aren’t in the dark peacock colour that I had originally hoped for, because BM2 had other ideas. I am still not 100% convinced about the ‘Montego’ colour (a bright turquoise) – but its not too bad. I hope to be able to see their version of peacock (a dark royal blue) before making the final decision in July. The weight loss has been greatly accelerated this week! I went to year seven camp, which was a great chance to do all sorts of energetic type things, like multiple kilometre night walks across soft sand dunes, up and down hills, during which I got the dirtiest feet I have ever had; and horse riding, which was awesome, except for my newly acquired pretty purple and green patterns across my tummy, from sliding off the horse at the end of the ride. Poor thing, I swear she gave a sigh of relief to be rid of me. That night when dinner time rolled around, I was surprisingly not hungry. I had been ravenous at all of the previous meals, because as everyone knows, camp makes you hungry! however, I was feeling rather queasy, and decided to skip the meal. About 3 hours later, I was more than queasy, and rang Mr G to come and get me. That was Tuesday night. Its now Friday, I’ve been off work all week after being diagnosed with food poisoning (although work seem to want to write it off as a virus – therefore not covered by workcover – please, over 30 people came down with exactly the same symptoms, within 24 hours of each other – its so food poisoning). But the silver lining! I’ve lost 7kg’s!! What we’re not talking about, and absolutely not thinking about, are the results of Mum’s chest x-ray, and sudden, urgent CT scan, which we wont have definitive answers about until next week. We’re not thinking about the words Hodgkins Lymphoma, or the fact that 25 years ago, she used to smoke 60 cigarettes a day. And we are certainly not Googling to find out what enlarged Hilars are, or convincing ouselves of other, much scarier possibilities. No. Not freaking out at all.